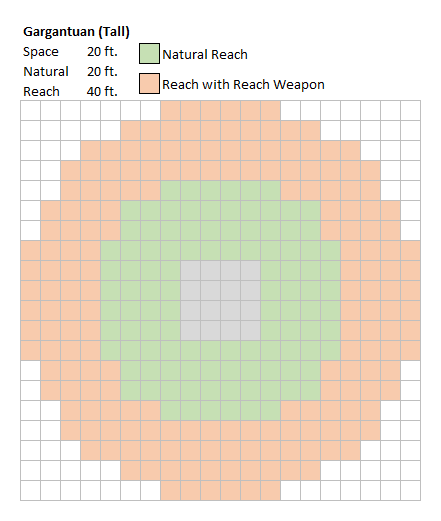 This page includes examples of creature’s sizes, space they occupy, and various area-of-effect templates to aid you in visualizing combat and encounters. Just because things are normally expressed on a flat grid doesn’t mean they’re actually flat. Any effect with a radius affects a sphere, not a circle. A cone is a 3d area. A line is a line, not a plane. The rules often assume that creatures are Medium or Small. 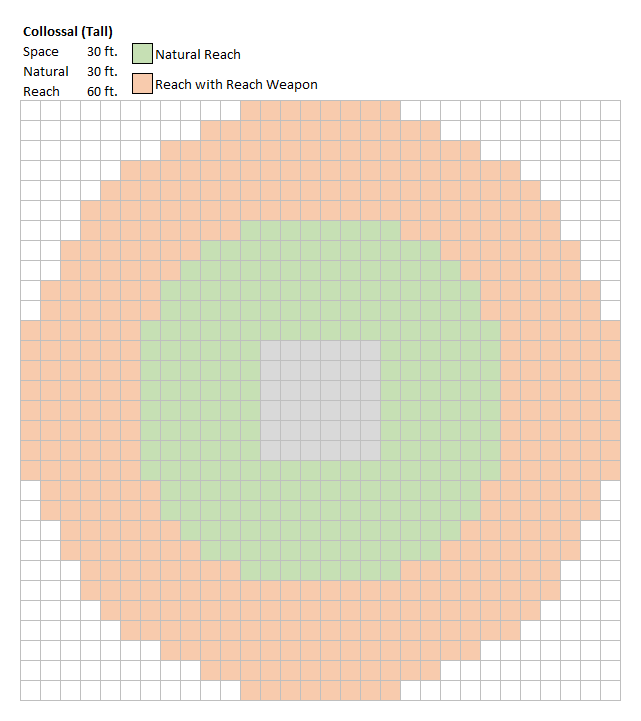 In the case of a handful of spells or effects with areas that feature a “radius emanation centered on you” such as antimagic field, aura of doom, and zone of silence, as well as some of the spells presented in this section, this can result in an area that is effectively useless when coming from a Large or larger caster. As an optional rule, when a creature casts an emanation or burst spell with the text “centered on you,” treat the creature’s entire space as the spell’s point of origin, and measure the spell’s area or effect from the edge of the creature’s space. 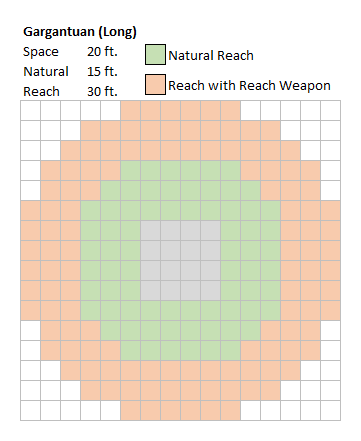 For instance, an antimagic field cast by a fire giant would extend 10 feet beyond his space (effectively increasing the emanation’s radius by 5 feet). In the cone templates below “C” is the caster of the spell or the origination point of the effect. If “C” is replaced with (c) that indicates that the caster may choose one of the (c) positions. In the line templates below “C” is the caster of the spell or the origination point of the effect. 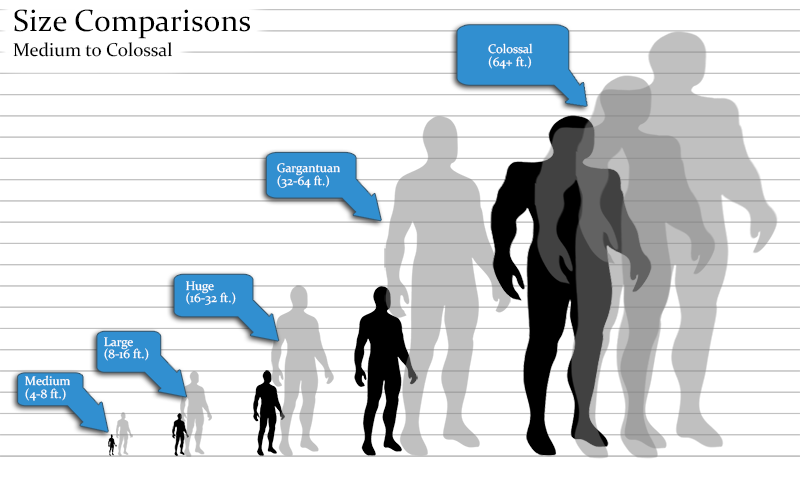 A creature’s size comes up frequently. Here is some of the more commonly required information. 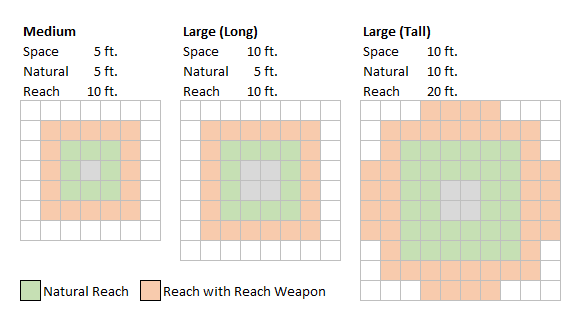 Below this table are several diagrams showing a creatures space, reach, and reach wielding weapons. Diminutive +4 -4 +6 +12 1 ft. 0 6″ to 1 ft. 1/8 lb. – 1 lb. Tiny +2 -2 +4 +8 2-1/2 ft. 0 1′ to 2 ft. 1-8 lbs. Small +1 -1 +2 +4 5 ft. 5 ft. 2′ to 4 ft. 8-60 lbs. Medium +0 +0 +0 +0 5 ft. 5 ft. 4′ to 8 ft. 60-500 lbs. 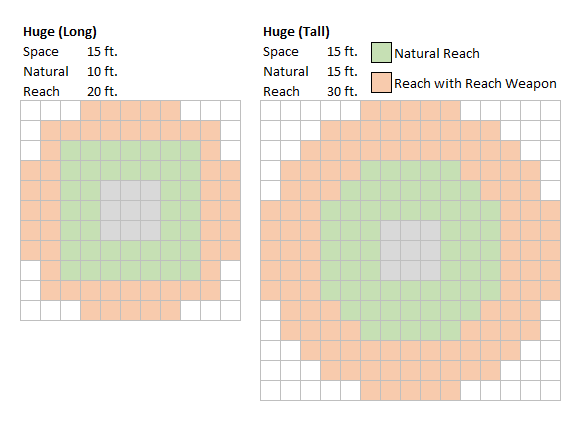 Large (tall) -1 +1 -2 -4 10 ft. 10 ft. 8′ to 16 ft. 500-4000 lbs. 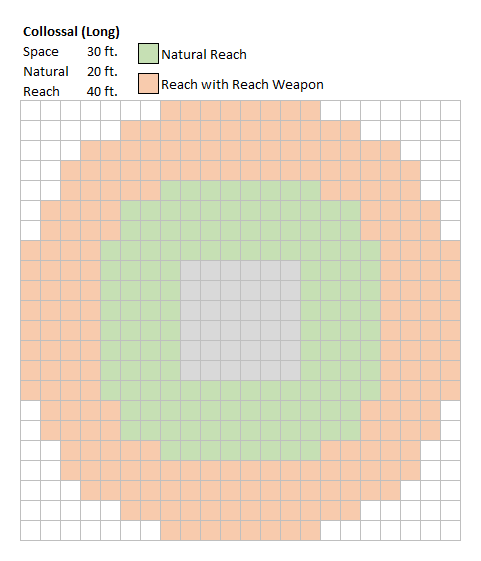 Large (long) -1 +1 -2 -4 10 ft. 5 ft. 8′ to 16 ft. 500-4000 lbs. 2 A creatures special size modifier applies to it’s Combat Maneuver Bonus (CMB) and Combat Maneuver Defense (CMD).